Every silver lining has a cloud. After a decade of economic turmoil, financial services industry is reaping profits again. But customer trust? not so much. In fact, trust in a financial service, be it banking, insurance, wealth management is at an all time low. What treatment can be applied to better the scenario? 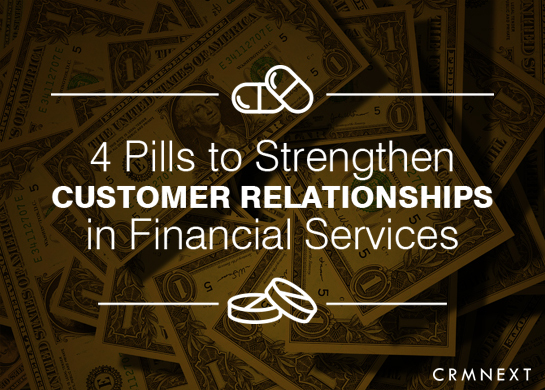 Here are four pills that, if taken regularly, can enhance customer relationships in financial services. Frontline staff, the face of your company to your customers, should be equipped and trained in a customer-centric technology like CRM for financial services. In this way, a customer's interest rather than team targets will take precedence. Being 'target' oriented may have been lovely a decade ago, but today being 'customer' oriented is rewarding. Your business should be proactively transparent when it comes to managing customer's hard earned money. Empower customer service representatives with the help of financial CRM solutions. For example, make KYC collection and verification automated for speed, convenience and compliance. Today, no business can hide their dealings. The Wells Fargo episode is a reminder that facts can take their revenge. A financial CRM platform will directly integrate itself with regulatory bodies for seamless compliance. Prevention is the best action powered by CRM in financial services. There is a reason businesses show a fondness for big data. It gives much needed insights that help companies predict customer banking needs and ensure product fit —present customers with upselling and cross-selling options that make sense for their unique financial situation. You get this profile information captured from interaction and transaction history, displayed in a powerful 360-degree view. The back-end analytics in CRM will then crunch and mash data to display smart cross-sell offers that will be more than enough for conversions. Departmental barriers are an impediment to business growth. The advent and rapid adoption of fin-tech is solely due to the fact that customers are now able to get all financial services in one window. Operations without any barriers will enable faster go to market deployments, thus generating faster profits. Eliminate the artificial barriers between human and digital channels to provide customers with improved service across channels. Make interactions frictionless and efficient in the branch, by phone or via web and mobile. Don't just bank on your outstanding product or service to bring in business. Use the above pills in the right dosage to strengthen customer relationships.